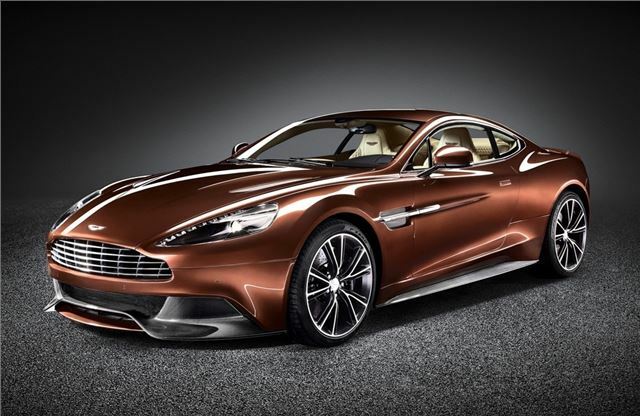 Aston Martin has revealed its new Vanquish - the luxury hand built sports car which sits at the top Aston's line-up. Powered by an upgraded 6.0-litre V12 engine it goes on sale later in 2012 with prices starting at £189,995. Designed and built at Aston Martin’s headquarters in Gaydon, Warwickshire, the styling of the new Vanquish is inspired by Aston Martin's limited edition One-77 supercar with similar LED rear light blades and a similar side profile. Other noteworthy details include the new Aero Duct on the boot lid. This counteracts lift at the rear when travelling at high speed and also adds to the sleek design. The V12 normally aspirated engine has been upgraded with 573PS which makes it Aston Martin's most powerful production model yet, only outdone by the £1.2 million One-77. Along with 620Nm of torque the 6.0-litre engine propels the Vanquish from 0-62mph in just 4.1 seconds and onto a top speed of 183mph. Aston says the Vanquish is as happy on the city streets as it is on country roads or long motorway journeys. It's helped by the Touchtronic 2 six-speed automatic gearbox which is already used throughout the Aston range. Other improvements include a newly designed and more spacious interior plus a boot that's more than 60% bigger than the Aston Martin DBS and boasts 368 litres of space. Available as a 2+2 or a 2+0, each body panel of the new Vanquish is made from carbon fibre because of its high strength-to-weight ratio and flexibility. This helps torsional rigidity which is improved by more than 25%.